Recently, China was accused by the Philippines for causing a vast ecological damage in the South China Sea. 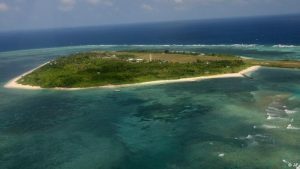 The Philippines claimed that China’s reclamation activities in the shores of the sea destroyed a substantial territory of coral reefs and caused large losses to other countries. Respectively, they made an attempt to draw the attention of the world community to the issue of marine ecosystem damaging and the damage caused by these actions to the coastal nations. China’s activities around the coral reefs were claimed even earlier. Recently, they caused concerns of the claimants, including the Philippines and Vietnam, as well as the United States. The mentioned countries expressed their worries regarding the results of the actions of China, and the US criticized it strongly. With regard to the politics, the United States revealed their disapproval of China. It was connected with China’s use of power and disregarding the smaller countries in the region. As it is claimed, China’s activities cause an irreversible damage to the biodiversity in the sea by violating the natural balance. While the Philippines encourage China to adhere to the informal code of conduct and to solve maritime problems legally, China does not recognize its fault. In addition to the accusations of causing damage to the sea shores, China was also accused of tolerating harmful fishing in the area of their control. The political problems and the environmental claims of the Philippines tend to be interconnected. This happens as far as besides ecological issues, they raise the issues of seized areas. In addition to the potential destruction of the marine biodiversity, the statements of China with respect to the plans for reclamation, it would also cause militarization and is perceived as the threat to local peace and stability. The topic of the marine destruction of the South China Sea is highly relevant to the class for a number of reasons. Firstly, it concerns one of the four environmental issues that is shared by all countries. Secondly, the article promotes an understanding that we need the programs for sustainable development to solve the growing ecological challenges. Thirdly, the article mentions the need to follow agreements that were signed by the countries and to act in accordance with them, especially if the issues concern long-term and irreversible issues like the destruction of the marine biodiversity. Finally, the article drives the readers to a conclusion that active actions are required to cope with the growing threat of ecological catastrophe. Moreover, as it can be concluded, only common actions and the unity between the countries can lead to positive changes and have positive outcomes. To my mind, the society needs to draw attention to the issue of China’s reclamation of the sea shores. While it poses a threat to the ecological situation in the South China Sea, it also presents the political problems. These problems need to be solved since their continuation would cause further complications. I believe that is necessary for the involved countries to unite and work together to solve the problem and save the natural environment of the sea. This would imply making definite concessions by Chinese authorities, considering that their activities are so widely discussed and criticized. This would allow reducing the tension surrounding the problem and start the process of looking for an appropriate resolution. The solution would need to have the basis that would be beneficial for the environment to avoid further destruction. “Philippines Says China’s Reclamation Causing Ecological Damage”. Business Insider. N.p., 2016. Web. 25 Apr. 2016 . <http://www.businessinsider.com/r-philippines-says-chinas-reclamation-causing-ecological-damage-2015-4>. “Beijing’s South China Sea Projects ‘Highly Disruptive’ To Local Ecosystems | Asia | DW.COM | 16.04.2015”. DW.COM. N.p., 2015. Web. 25 Apr. 2016. Previous What’s putting the brakes on driverless cars?